In Defense Of Poltergeist III. I've always been a fan of the Poltergeist films. The original is an absolute classic, and the sequels, while admittedly not as good, were still entertaining. That said, the third installment was always considered the worst of the original trilogy (and rightfully so), but I still it has merit. 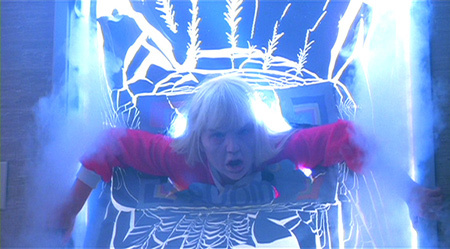 Despite some hilariously bad acting and a flimsy storyline, Poltergeist III has a handful of fun scenes and enough creative camera tricks that make it worth watching. With that in mind, I've written a new article for Blumhouse in which I attempt to make a case for Poltergeist III. Hope you enjoy it, and may all skeletons in horror films from this day forward have big, bushy mustaches! After watching Poltergeist III, I was scared of mirrors for probably longer than I should have been. In my defense, I was 8 when the movie came out. Adam - Yep! And if the Poltergeist spirits in the mirrors didn't get you, Candyman certainly would! it's a lot of fun taking the positive route once in a while and looking at the things a crummy movie did well. I can already think of a lot of flicks (haha remember when people said that?) where the flaws have been gone over and over until it's cliché, but the highlights get overlooked! Uhh.. Mystery Men comes to mind..
ColdFusion - Mystery Men needed 100% more Flaming Carrot, but it did make me want to own a translucent bowling ball with a skull inside. I've never even seen Poltergeist 3, but after reading your article I think I need to. And you were right about the mustache. If they ever made Poltergeist 4, that thing would return as the new Tangina. Freddy's dead, baby. Freddy's dead. Previous post: Gollum, Captain America: Civil War, & Keith Apicary! Next post: In Defense Of Freddy’s Dead: The Final Nightmare.